Liberals have been demanding the removal of Confederate monuments and memorials across the country, and some city leaders have obliged. Memorials in Baltimore, New Orleans and Durham have been taken down. But some have argued that there are monuments to racism that liberals are ignoring — because the people memorialized were all Democrats. While slavery was arguably the worst and darkest chapter of our country’s history, racism didn’t end with the Civil War. According to Breitbart author AWR Hawkins, if liberals really want to stamp out monuments and memorials of racist Americans, there are 12 that they can’t ignore — but will, because all 12 are Democrats. Yet no one is complaining about memorials to an actual Klansman who opposed the Civil Rights Act? President Lyndon B. Johnson was also a reported racist, allegedly calling the Civil Rights Act the “n—– bill.” He is memorialized with the Lyndon Baines Johnson Memorial Grove on the Potomac. President Franklin Delano Roosevelt was not only a socialist, but also ordered for Japanese-Americans to be held in internment camps, something almost universally condemned today. 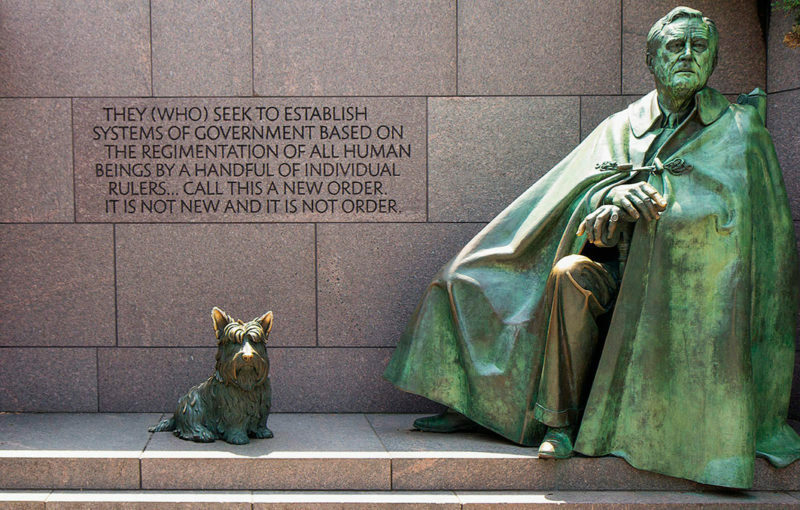 He is honored at the Franklin Delano Roosevelt Memorial in Washington DC. Presidents Andrew Johnson and Woodrow Wilson were also reportedly racist, yet both also have memorials standing in their name. Should these memorials also be removed?